The ongoing story of our family. Let me start by making something clear: I like to shop as much as the next girl. I really do. But somehow, car shopping isn’t nearly as fun as shopping for a new pair of cute sandals or a new outfit at Nordstrom. It’s just not. Add to it that I spent today car shopping in 90 degree heat – which is actually pretty mild for South Texas (it’s only June) – and that I’m doing it in San Antonio. Where our car died on IH-10 yesterday. And you’ve got a pretty bad start to our week off. The good news is that I found a new (to us) car. The bad news is that it’s white. As in, only slightly better than the grey of my old van. 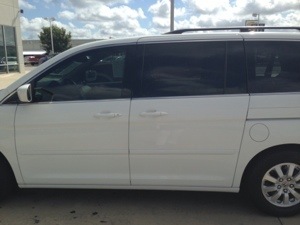 But it’s 5 years newer, and is a pretty pimped out ride…as much as a minivan can be anyway. Speaking of my old van, it was a pretty tense couple of minutes on the freeway yesterday, when we started smelling smoke and realized it was coming from our car. Then the car dropped out of gear and we literally had to coast off the highway to a place where Brad could check the engine. Yep. It was smoking alright. But God is so good! 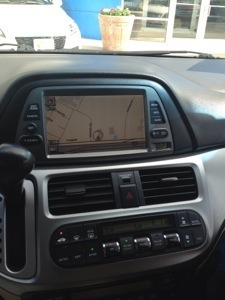 We were extremely close – just a couple of miles – from a Honda dealership! Brad pulled in, we piled out of the car – all of us including the dog – and waited for them to confirm what we already suspected, that our transmission got really angry and blew up. Actually it blew a gasket – apparently a really important one, because it leaked all the fluid out (sorry, San Antonio) and seized up. You know what really is ironic about that? We JUST PAID to have Aamco look at the transmission. Again. And they put some kind of engine mounts that were apparently made of pure gold onto the engine so it wouldn’t shake or something. I’m not very good with the technical stuff. I know you’re shocked. Also, I spent like 2 hours without wifi at Goodyear getting the brakes fixed just last week!!! All that time and money down the tubes because when we heard the cost of the repair on our car was almost exactly the same amount that the car was worth, well, we just threw in the proverbial towel. There’s only so far you can go until words like “money pit” start coming to mind. So that was yesterday. Again, thanks to the providence of God, my mom was able to come pick us up in her SUV – just took her around 40 minutes to get here – and we all packed in like sardines. That’s the point at which it really hit us that we were in need of some new wheels. So today I rode back to San Antonio with my parents, who were already headed this way, and walked around sweltering hot car lots until I thought the soles of my cute sandals were going to melt and become one with the pavement. But my perseverance paid off! Because we now have a way to get home, which will become infinitely more important after I spend the next few days lying around in the A/C at my parents’ house. Let the real vacation commence!!! ← How Did He Think Of That? Just another tale of how a Ford came to the rescue of some other lesser car. I hear it all the time. Ouch. I would make a snide remark back…but I’ve got nothin’.